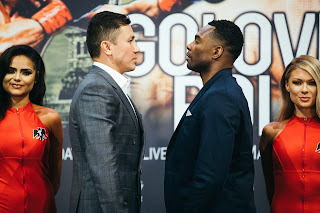 The official weigh-in for Friday night’s first Premier Boxing Champions card of 2017 headlined by unified WBA/IBO Jr. Middleweight world champion Erislandy Lara and former WBA Jr. Middleweight world champion Yuri Foreman took place on Thursday in Hialeah, FL. The official weights for the entire card are as follows. Erislandy Lara (Champion) 154lbs. vs. Yuri Foreman 153lbs. Anthony Dirrell 169lbs. vs. Norbert Nemesapati 168lbs. Juan Carlos Payano 118lbs. vs. Isao Carranza 118lbs. Edgardo Rivera 134lbs. vs. Dennis Galarza 135lbs. Robert Daniels 180lbs. vs. Antonio Alicea 179lbs. Alex Martin 146lbs. vs. Miguel Cruz 146lbs. PBC: Lara vs. Foreman takes place Tonight (Friday, January 13th) at Hialeah Racing & Casino. In the United States, the card is being broadcast by Spike TV beginning at 9PM ET/PT. Check your cable/satellite provider for time and channel in your area. Check your listings internationally. For more information on Spike TV and Spike Sports please visit: www.Spike.com. For more information on the Premier Boxing Champions Series please visit: www.premierboxingchampions.com.